New design, new name. That’s how “Stitch” was born. Unfortunately the Department of Zoning vehemently disagreed. 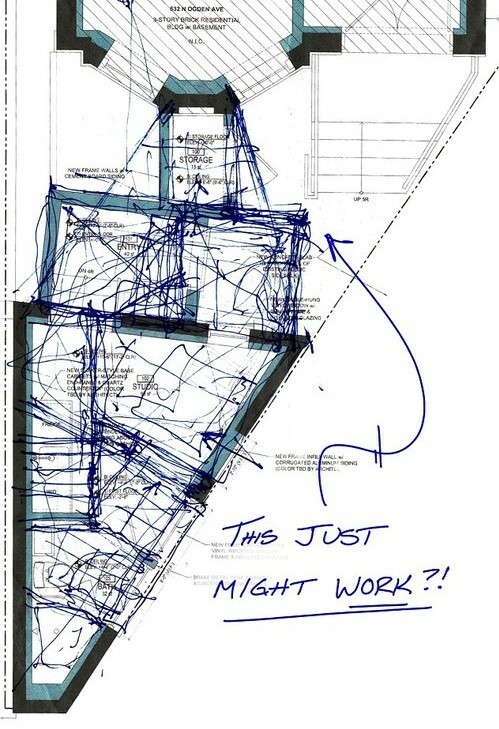 The Chicago Zoning Ordinance states that “No more than one principal detached residential building may be located on a zoning lot,” (CZO 17-1-1300) a requirement that continues to irritate architects on a regular basis. This frustrating section is the reason that coach houses are illegal throughout the city, (more on that later.) So despite the fact that two buildings had existed on this lot for more than 80 years now, we would not be able to continue using them in that form. Basically the small, triangular building would need to be torn down, as it was a “non-conforming” structure and no amount of arguing on our part could change that fact. A wasteful & sad result, obviously. But we firmly believe in revitalization over demolition, and we’re just plain stubborn about preserving older structures. 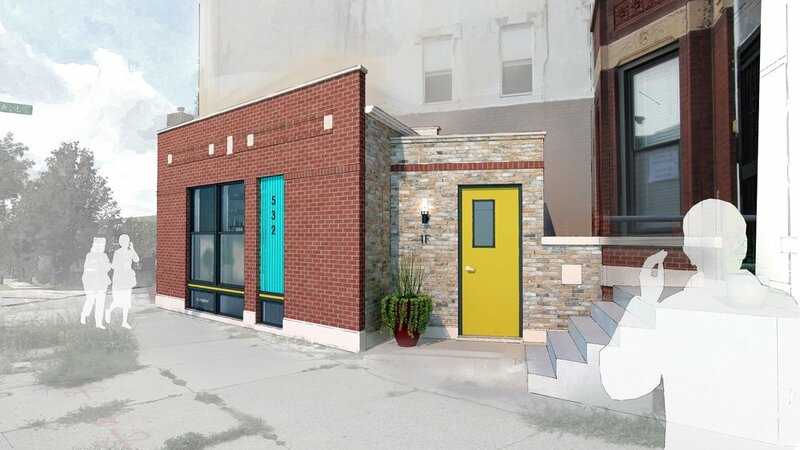 So even though our original design could comfortably fit a new micro-unit entirely within the existing building - no new construction necessary! - we had to find a way to combine the existing 3-flat with it’s smaller neighbor & create “one principal building” in a way that would satisfy the Zoning commissioners. This was further complicated by a large bay window at the front of the 3-flat, which provides natural light to the living rooms of each unit & greatly restricted the amount of solid wall for us to work with. We had to make the largest connection possible, while also making it as small as possible - no problem, right? Our solution was an inverted triangular addition to the back of this triangular building. 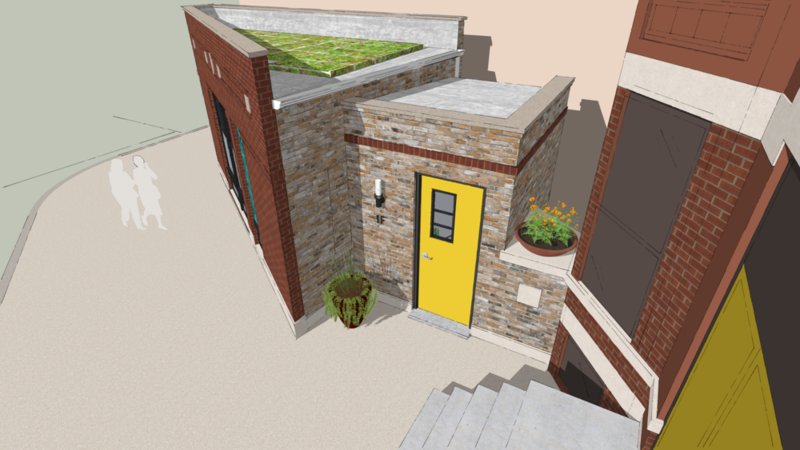 The small addition pinches down to a mere 3’-4” wide where it connects with the 3-flat, and widens as it approaches our micro-building. This addition manages to “stitch” the two buildings together with common building materials (brick) and key design details. One “principal building,” while minimizing any negative impact on the 3-flat & preserving what makes this small building so special in the first place. Goodbye 530½, hello Stitch.